Assuming you have copyright and permissions etc to do this, it can be very useful to record what you see and hear on your computer screen. For example you are doing an online course and you'd like to view the lesson which has video and audio on a plane. This tip uses two bits of free software: QuickTime X (on Snow Leopard and later ie Snow Leopard, Lion and Mountain Lion) and Jack from www.jackosx.com/download.html. If you have Lion or Mountain Lion you'll need the v0.9 beta 64/32 bit version. Pretty good documentation is here. The basic premise is that we are going to take audio from one application and route it to another application ie bypassing the system. First off get the download and install. Jack works at pretty low level so you'll need to do a restart. In the example above, which I borrowed from the documentation, we are going to get audio from a system 'port' and send it Audacity. But you could equally use "a send port" as iTunes. 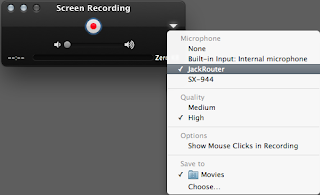 In my case I wanted to send the audio from a Java application to QuickTime for the screen and audio capture. So I selected Java on the left and QuickTime on the right. You'll know which send port you are using since they go red. So start a new recording in QuickTime X, and in the drop down box on the right hand side, click in and you should see "JackRouter". Then click the red button and either record full screen or window. I found that an hour on a lesson with audio took about 130MB, so quite efficient really.